Whether you’re simply looking to house those holiday decorations until they’re needed again next year or you’re seeking a more permanent solution to storing clothes and books, Blue J Storage is here to ensure that your needs are met. Our immaculate self storage facility in Safford, AZ is well-kept and pristinely maintained to meet and exceed your storage needs, no matter what they may be. Upfront, honest pricing: While other self storage providers have been known to surcharge for different storage options, tack on maintenance fees and even upcharge for 24-hour access, Blue J Storage is here to provide you with one price that’s all-encompassing. Our pricing is upfront, honest and competitive, ensuring that you’re getting the full value for your money! Bulk discounts: Looking to rent more than one unit at a time? Call or come by to learn more about bulk rental discounts and how we can help you save money by storing with us. Total access: When you rent a storage unit, you should have complete and total access to the contents of that unit at all hours of the day or night. With 24-hour access, 365 days a year, we promise that getting to your unit will never be a problem. Cleanliness: No one wants to utilize a storage unit that’s decrepit, dirty or infested with pests! We take care to clean our units before you ever even move in and maintain the integrity of our facilities on a monthly basis by having them inspected and treated by an expert exterminator. 24-hour support: Customer service and satisfaction are our top priorities. If you’re renting a unit with us, expect direct access to a customer service representative at any time of the day or night and when you’re through speaking with them, expect nothing less than complete contentment, no matter the issue. Chateau lock rental: Looking for some added protection for your rental unit? For a small down deposit at the time of your rental, you can secure a chateau lock for additional peace of mind. 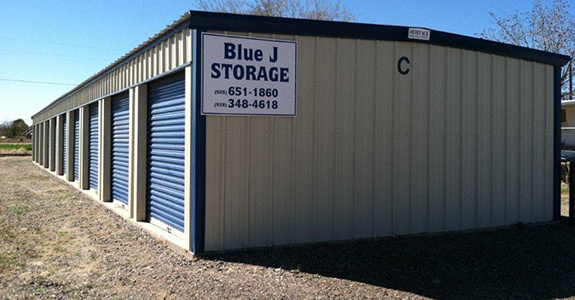 If you’re looking for affordable storage units in Safford, AZ, the clear choice is Blue J Storage! With a decade of experience on our side and complete dedication to your satisfaction, we’ll help you get the storage space you need, at a price you can afford, with the peace of mind you desire. Give us a call today at 928-651-1860 for pricing information or to learn more about our facilities.